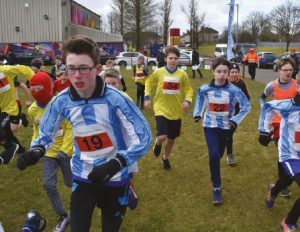 BB athletes competed in the Scottish Cross-Country championships in Thomas Shanks Park in Johnstone on Saturday 17th March. Clinching first place in the Juniors category was Tejay Scott, from Dundee & Angus Battalion. Brodie Aitken (Airdrie, Coatbridge & District) and James Gillon (Wishaw & District) took the Intermediate and Seniors titles respectively. This was the second year running where Brodie and James took home an individual title. In the team competition, it was a clean sweep for Airdrie, Coatbridge & District which took first place in each of the three competitions. Runners braved near-freezing conditions during the event, which was hosted by Paisley & District battalion.